Owen is now in 6th grade and is having a blast at school, playing soccer, baseball, and taking piano and flute lessons in his spare time. including a new interview with Owen at the bottom of the page. And check out the new film noir-style movie trailer, “The Maltese Tweedt” in the videos section. The most recent photos of Owen are on his 9th Birthday Page. 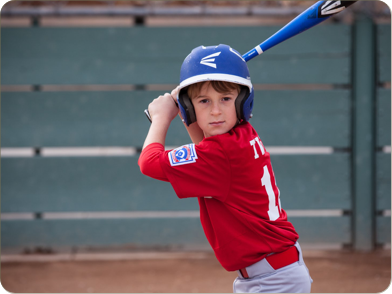 LEFT: Owen stares down the pitcher... er cameraman. 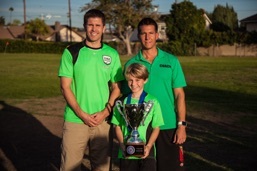 ABOVE: Owen holds the cup as the JUSA Banditos placed 1st for soccer in their age division! Congrats! 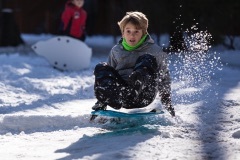 ABOVE: Sledding in Idyllwild to bring in 2017.